The Tomahawk Monument Company is a second generation memorialist serving all of central and northern Wisconsin. Whether it's an at-need or pre-need sale, we want the family to consider us their personal memorialist and to visit us with any and all of their families memorial needs. By involving our customers in the design process, we ensure that they not only know exactly what they are getting, but that they are helping to create something that truly represents the life to which they pay tribute and that it will forever invoke fond memories of their loved one. Located in the City of Tomahawk, Wisconsin at 20 N. 2nd Street right across from City Hall, we do all our own design, cutting, shaping, chiseling and sandblasting. From sales to setting, the job is done by TMC. We keep on hand several colors and styles of monuments so we always have a nice selection to choose from. 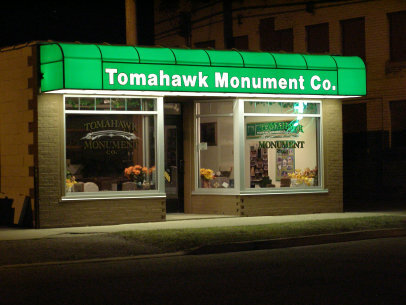 The Tomahawk Monument Company takes pride in its customer service. From sales to setting all work is done right here in our shop. When your memorial is complete you will recieve a photograph of your memorial in its setting along with the final invoice. All questions and concerns are addressed immediately. Our goal is the complete satisfaction of every customer. Let us be your families personal memorialist. Tomahawk Monument maintains membership with the Wisconsin Association of Monument Builders and Monument Builders of North America which holds their members to higher standard of quality.